Powers/Abilities: Assassin-8's cyborg form includes various weapons built into his right arm, including an arm cannon able to generate fiery energy bolts, eight micro-grenades, twelve harpoon blades (fired like arrows), gas jets, some sort of electrical discharge device and a small flare bulb capable of blinding people for around ten minutes (the last two only demonstrated by Earth-9411 Assassin-8, but it is a fair assumption that 616 has these too). He has "unit boosters," though it is unclear if these are to enhance his weapons or flight, or both. He can fly via leg thrusters, which leave no visible energy trail, plus a backpack which leaves a burning energy trail; he only uses this last some of the time when flying, perhaps either for stability (he uses it to descend while standing vertically, making it easier for him to aim a shot) or for when he wants to make extra haste. Though much of his body is metal and already extremely durable, he also wears armor and a protective hood when expecting combat. His bionic limbs possess an unspecified degree of superhuman strength, strong enough to rip a metal Tube train door off with ease and swing it around without strain. Booth is a highly trained combat veteran, skilled both as a marksman and in hand-to-hand combat, but his insanity sometimes interferes with his efficiency. 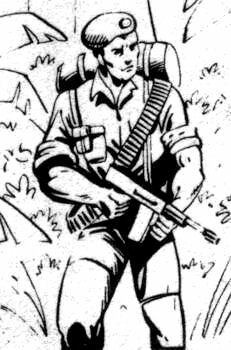 History: (Spider-Man #607, fb) - Andrew Booth was a mercenary soldier. (Spider-Man #610, fb - BTS) - Booth believed he had honor and power, and that he was feared and respected. (Spider-Man #607, fb) - While on a fateful mission in Angola Booth tripped a landmine and was caught in the resulting explosion. (Spider-Man #607, fb - BTS) - Booth nearly died., but "his people" found him and had him rebuilt as a cyborg killing machine, a walking arsenal. However Booth considered himself a clanking travesty of a man, and to reflect this he picked a new professional name: Assassin-8. Booth was racked with the desire for revenge, but could not take it, as he did not know the identity of whoever had caused the explosion. (Spider-Man #607) - Thursday, 27th October 1983. While drinking in Ye Old Kings Arms pub in London, his lower face obscured by a scarf to hide his metallic jaw, Booth was approached by an unidentified telepath (the Dark Man) who revealed he knew about Booth's accident and new status. The telepath falsely claimed that Spider-Man was behind the explosion, and Booth, blinded by his rage and the telepath's subtle psychic influence, accepted this and swore to slay the web-slinger. 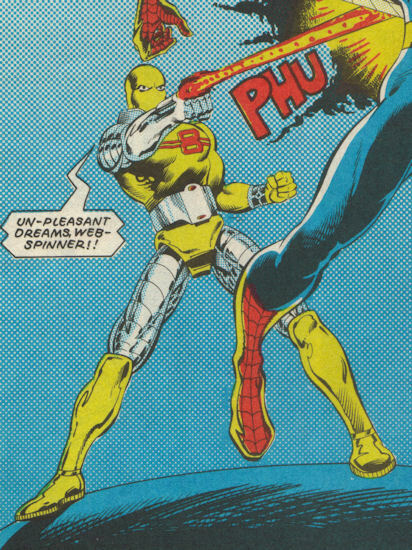 A few days later, with Spider-Man reported to have come to the U.K. to appear as a guest on the television show Saturday Starship, Assassin-8 checked his weapons and donned his armor, consumed with the need for revenge against the man he believed had destroyed his body. (Spider-Man #608) - Saturday, 29th October 1983. Peter Parker had flown to the U.K. so that Spider-Man could appear as on Saturday Starship. Afterwards Spider-Man took the train from Birmingham, where the program had been filmed, to Euston Station, London, where fans were waiting to greet him. Assassin-8 watched from an upper floor walkway as down below in the main concourse Spider-Man signed autographs. Monsters manifested via the Dark Man's magic attacked the wall-crawler, but Booth waited until the creatures eventually dissipated before revealing his presence and assaulting the hero. Tired from dealing with the monsters, caught off guard and trying to protect innocent bystanders caught in the crossfire, Spider-Man initially fared poorly, but as Assassin-8's temper rose at confronting the man he believed was to blame for his loss of humanity, he began firing more wildly. Dodging the blasts, Spider-Man clogged up Booth's blaster arm barrel with webbing, and it exploded, knocking the mercenary out. Spider-Man left the villain for the authorities to deal with. (Spider-Man #608 - BTS) - The army was instructed to clear up the mess caused by the battle and to collect Assassin-8's body. Thinking him deactivated and harmless, the army only assigned two privates (Jimmy and another unidentified) to collect the cyborg's body. (Spider-Man #608) - As the two soldiers began examining him, Assassin-8 woke and slew them without a moment's hesitation, then limped away, planning to have himself rebuilt so he could try to kill Spider-Man again. (Spider-Man #609) - Monday, 31st October 1983. With his already tenuous sanity deteriorating under the weight of his anti-Spider-Man rage, Booth visited the Armourer, a mechanic whose equipment had been paid for by Booth's "people"; Booth had him construct and attach a new arm unit. (Spider-Man #609 - BTS ) - Wednesday, 2nd November 1983. Assassin-8 informed the authorities that he had set bombs to destroy the Thames Flood Barrier, and demanded that they recruit Spider-Man, who was still enjoying sightseeing around the British capital, to deal with him, or else Booth would remotely detonate the explosive devices. (Spider-Man #609) - Spider-Man was flown by helicopter to the Barrier and used his spider-sense to locate and disarm the bombs, but once he had dealt with the last device, Assassin-8 ambushed the wall-crawler, blasting him from behind while he was trying to figure out why his spider-sense was still tingling. (Spider-Man #610) After stunning the wall-crawler, Assassin-8 lifted his foe overhead to throw into the river below. Spider-Man woke just before the cyborg flung him off the top of the Barrier, and the groggy hero tried to get ready for hitting the water, but Assassin-8 swooped down and snatched him again at the last second. Flying high above the city, Assassin-8 informed his still shaken opponent that they were going somewhere public, as Assassin-8 wished to humiliate and then physically destroy the hero in front of as many witnesses as possible. Booth dropped Spider-Man over the Houses of Parliament, and the webslinger narrowly managed to fire some webbing onto the Clocktower of the Palace of Westminster (colloquially, albeit inaccurately, known as Big Ben) and save himself from impacting on the ground below. Unsure what past misdeed Assassin-8 was blaming him for, Spider-Man tried to apologize, but this only angered Assassin-8 further, and the cyborg confused the wall-crawler even more by mentioning Angola as the place their feud originated. Refusing to believe Spider-Man's insistent claims that he'd never even been to Angola, Assassin-8 pursued the fleeing hero as the webslinger sought a more secluded spot to fight, away from so many innocents. Assassin-8 chased his quarry into Gloucester Road Underground Station, and though there were still bystanders around, the cornered Spidey was forced to fight. As a train began pulling in, Spider-Man, fearful for the passengers' safety, called out to a member of the station staff to get the train to keep going, but Assassin-8 reacted angrily to the implication that he might deliberately hurt innocent bystanders...and to prove his point, he ripped one of the doors off the train, terrifying those inside, then used the door to batter the wall-crawler. Spider-Man retreated rapidly, leaping over and round the train, with Assassin-8 hot on his heels, but as they swung over the other track, Spider-Man spotted another train rapidly coming into the station behind Assassin-8. 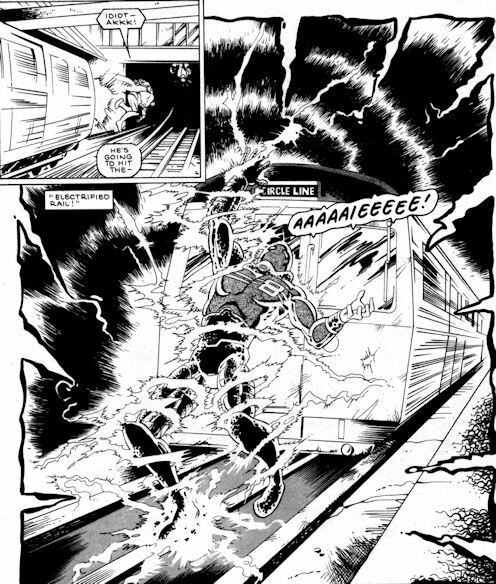 The hero called out a warning, but Booth ignored him, and moments later the cyborg was struck by the train and flung against the electrified rail. The station staff checked on the injured Spider-Man and informed him that Assassin-8 was dead. Not stopping to check for himself, the weary hero departed. Comments: Created by Mike Collins, Barry Kitson and Mark Farmer. In case it's not clear from the text, Assassin-8 appeared in an original U.K. story which was published in the weekly Spider-Man comic, the same tale that introduced Thunderclap. Comments within the story help place where it belongs in relation to Spider-Man's US titles, with Spidey thinking about his relationship problems with the Black Cat, and recent encounters with Frog-Man. The end of the story leads directly into the start of Amazing Spider-Man Annual#18. See the Dark Man sub-profile below for comments as to who the mystery man was, and why this story was written in the first place. 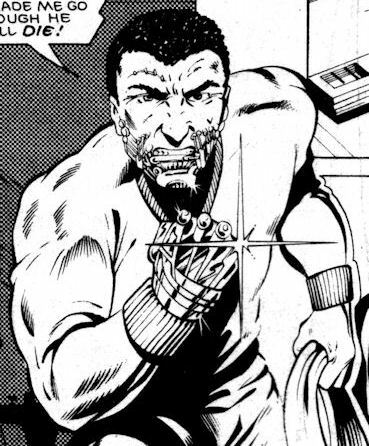 Booth was saved by his "people," who also arranged for his rebuild and equipped Frankie Sayle, the Armourer who made his replacement bionic arm. However, it was never explained who these "people" were - fellow mercenaries and friends of Booth, shady employers, someone else? Your guess is as good as mine. However, the alternate reality Booth of Earth-9411 worked for the Secret Empire - though there is no indication in that story (see below) that the Empire created Assassin-8, making injured people into cyborgs isn't exactly outwith their remit - just as Midnight, Moon Knight's old partner. The dates of Spider-Man's trip can be considered topical references. They were given in the editorial introduction page of Spider-Man #609, under the conceit of being entries in Peter Parker's diary. However, the day and dates match 1983 (e.g. 27th October was a Thursday in 1983, not 1984, the publication year), but the story also notes that the Thames Flood Barrier, here depicted as completed and open, wasn't finished until spring 1984. Presumably the editorial page was written by someone other than the story's scribe Mike Collins, and they didn't notice the discrepancy they were creating. 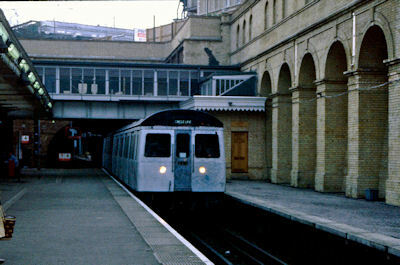 Though a station in the London Underground, the actual train platforms of Gloucester Road are open roofed and not strictly underground, hence why Spider-Man was able to websling down into the station while dodging an aerial pursuer. Assassin-8 was declared dead by a couple of Underground Station staff, but they didn't exactly examine him, and even if they had, they were hardly qualified to know. While London Underground staff are first aid trained, their knowledge of cyborgs is presumably limited, and it is likely that the shock merely stunned Assassin-8, rather than slaying him. 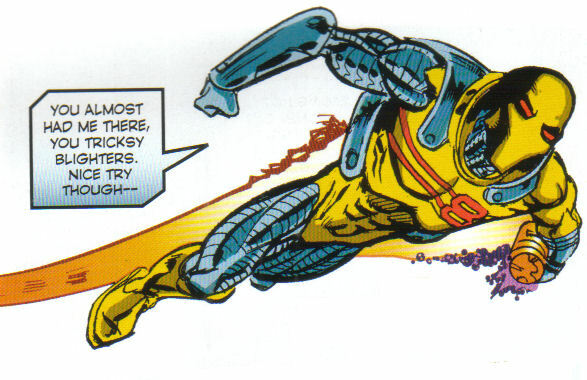 The story's scribe, Mike Collins, subsequently wrote a profile of the tale for Marvel Fact Files #97, in which he stated that the impact and electrocution shorted out Assassin-8's servos, "leaving him for dead" - note, not "killing him" or "leaving him dead," but "leaving him for dead." I think there's life in the old cyborg yet! (Marvel Heroes #35 fb, BTS) - Arnim Zola, director of the Secret Empire's European branch of operations, hired Assassin-8, offering to transfer his consciousness into a brand new, totally human body, as well as paying him a few million in hard cash, in return for carrying out a raid on Darkmoor Energy Research Centre in northern England. (Marvel Heroes #34, BTS) - The Empire instructed Assassin-8 to steal Doctor Hugo Travis's anti-matter research, as well as a device Travis had built to trap anti-matter particles and split them to generate massive amounts of energy. The cyborg breached the facility, targeting Sector Five where the Anti-Matter Lab was housed and triggering the facility's alarms. After swiftly overpowering the guards, all ex-SAS men, the villain downloaded the project's software files and snatched a canister containing the anti-matter particles the lab had created. (Marvel Heroes #34) - Coincidentally, at the same time as the raid, Travis was welcoming his former student Brian Braddock (Captain Britain) to Darkmoor; Travis had called Brian to Darkmoor because he believed the hero's personal forcefield would protect Brian if the experiment went wrong, allowing him to safely enter the anti-matter device's chamber and fix it. Hearing the alarms, they raced to Sector Five and confronted Assassin-8, but the cyborg blasted Brian, briefly stunning the hero just long enough for Assassin-8 to flee the area. Assassin-8's escape was barely slowed by an arriving security guard, but then the cyborg ran into Captain America (Steve Rogers), who had come to Darkmoor incognito after a raid on a US Secret Empire cell a few days earlier had clued him that Darkmoor was an Empire target. As the American hero battled Assassin-8, Captain Britain caught up with his quarry, but Assassin-8 blinded them with a flare, then smashed the energy chamber's control module, deliberately setting off a chain reaction in Darkmoor's reactor, intending for the eventual explosion to cover his tracks by destroying the facility. Assassin-8 then fled the facility. (Marvel Heroes #35) - Riding his motorbike, a pursuing Captain America caught up with Assassin-8 as the cyborg raced to his rendezvous with Zola. Cap tried to reason with him, pointing out that the canister was unstable and could potentially explode with a blast powerful enough to obliterate the entirety of the U.K. Announcing that he didn't care given what his employer had promised him if he delivered the canister, Assassin-8 blasted Cap's motorbike out from under him. The hero leapt to safety and pursued on foot, catching up as Assassin-8 halted at the rendezvous point. Cap swiftly stunned Booth with a shield throw, but Zola arrived in a heavily armed aircraft, his gunfire keeping Cap occupied and unable to retrieve the canister before Assassin-8 came round. Captain Britain intervened, having been delayed repairing the reactor, and downed the vehicle, but by this point Assassin-8 was awake again. He opened fire on the heroes, then noticed that the canister was now bleeping. Captain Britain informed him that this meant the canister had been damaged and was about to explode, but the cyborg assumed this was a ruse and began to flee, only to be downed once more by Captain America's flung shield. Grabbing the canister, Captain Britain swiftly flew it out of the atmosphere to detonate harmlessly in space. As the hero returned to Earth, Assassin-8 began to recover, but seemingly decided discretion was the better part of valour and chose not to try to escape again. Comments: Could this story feature the 616 version of these characters? Theoretically yes, but the Panini material circa the 2010s is generally considered out of regular continuity and part of Earth-9411, making the Captain Britain featured above the same Corps member who also fought the Fury alongside Spider-Man. Ferg Handley and co. knew the Panini stuff was "Marvel continuity Lite," but the Panini writers only treated the stories as featuring "classic" versions of the characters, uncluttered by any recent developments from mainstream Marvel (e.g. they'd use Steve Rogers here even if he was dead in regular continuity at the time), rather than actively considering them as being from a different reality - unlike us Appendixers, they aren't overly worried about drawing such distinctions. So this means that any new background info divulged for Earth-9411's Assassin-8 can probably be attributed to 616 Assassin-8 too, and it's entirely possible that 616 Assassin-8 might have had a similar encounter with Cap and Cap at Darkmoor. 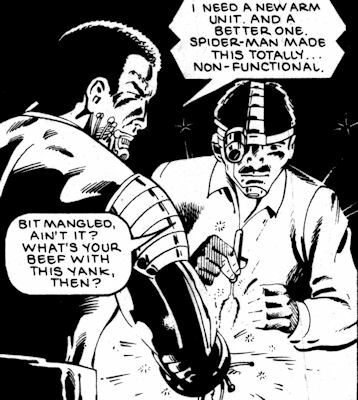 Captain Britain instantly recognises Assassin-8, but not vice versa, suggesting the hero knew of the cyborg by reputation. Similarly, after being briefed by Captain Britain, Captain America calls Assassin-8 by his civilian name, so clearly he's known to the authorities - if this Assassin-8 has a similar history with the 616 version, then he might have been identified after being taken into custody while stunned (rather than slain) by the electrocution in Gloucester Road Underground Station. Captain America-9411 dubbed his reality's Assassin-8 as "Section 8," referring to the medical term used to list military personnel as unfit for duty due to mental health problems. This nickname only applies to 9411 Assassin-8, though it is a fair descriptor for the nutty 616 cyborg too. (Spider-Man #609 fb - BTS) Frankie Sayle, a.k.a. the Armourer, was a man who lived for machines, loving to tinker with and build them. His equipment was paid for by Assassin-8's "people." (Spider-Man #609) - After his bionic arm was destroyed, Booth went to the Armourer for a replacement. The gadgeteer annoyed the unstable mercenary by repeatedly calling him John instead of Andrew, dismissing the cyborg's correcting him with "just an expression, John," but then pushed his luck too far by asking the mercenary, who was touchy about his lost humanity, if his visit was to have rust treated or for an oil change. Assassin-8 became aggressive and a scared Armourer apologized. He began building Assassin-8 a new and improved weapon arm; as he worked on this, he inquired as to Booth's reason for hating Spider-Man, and listened incredulously as Booth informed him that the American hero had planted the landmine which had destroyed Booth's body. Wisely, the Armourer kept his disbelief to himself. Comments: The character wasn't named in the story, but his calling Assassin-8 "John" and his referring to the cyborg as if Booth was a car reminded me of "Ullo John, got a new motor? ", a song by comedian Alexei Sayle which had charted in the U.K. in 1984, a few months prior to this story being published. Whether the link is deliberate or not, I can't say, but it prompted me to dub the mechanic Sayle, after the comedian. Subsequently, the story's writer, Mike Collins, profiled the story for Marvel Fact Files #97, naming the character "the Armourer" (n.b. correct spelling, as the character is British), AND revealing his given name is Frankie Sayle. MFF editorial confirmed that this was Mike giving the nod to this profile, an unexpected but much appreciated and way cool gesture on his part. Thanks Mike! (Spider-Man #607) - Though he looked human, the Dark Man was not human, but instead a creature of pure evil who took delight in treating people as his playthings, toys which he could break. For undisclosed reasons, he decided to target Spider-Man. (Spider-Man #608) - He was a creature of mystery, of dark powers, ... of death! He was a master of darkness. (Spider-Man #609) - He spun webs borne of magic. (Spider-Man #607) - Wednesday night. The Dark Man tormented Spider-Man with a nightmare, initially with a vision of new hero Thunderclap stealing Spidey's place, then with Frog-Man seducing the Black Cat, then with J.Jonah Jameson and the Hobgoblin laughing at a newspaper headline proclaiming Spider-Man's death. The Dark Man then stepped up the assault, attacking the dreaming wall-crawler with two-headed dragons ("sky serpents") and tentacles; his face hidden in darkness so that only his glowing eyes were visible, he taunted Spidey, telling the hero there was no escape from his power, threatening to trap him in darkness, and promising to end his misery forever. Spider-Man eventually awoke and wrote the experience off as a bad dream. Thursday. In London, the Dark Man approached Andrew Booth in a pub, showing him a vision of his life prior to becoming a cyborg and the explosion that stole Booth's humanity. Mentally influencing the unstable cyborg, the Dark Man convinced Booth that Spider-Man had been the person who planted the landmine. Friday. Early the next morning, the Dark Man sat in his house in Hillingdon, London, sitting the shadows while listening to Spider-Man's thoughts, amused by the idea of breaking his latest toy. (Spider-Man #608) - Saturday. When Spider-Man was in Euston Station, the Dark Man attacked him with manifestations of the two-headed dragons from the hero's nightmare. Spider-Man fought them, doing his best to protect innocent bystanders, but when Spider-Man refused to give up, the manifestations vanished. Moments later, Assassin-8 attacked the hero, but Spider-Man defeated him too. Sunday. The next morning Spider-Man discovered to his surprise and joy that the British press had painted him in a positive light in their reports on the battle, in contrast to how NYC papers normally reacted; the happy hero was unaware that the Dark Man was still monitoring him, having enjoyed the tormenting and taunting, but now looking forward to what was still to come. (Spider-Man #609) - Monday. The Dark Man continued to monitor Spider-Man from afar as the wall-crawler went sightseeing around the British capital, and also checked on Assassin-8, who had gone to have repairs done on his damaged arm in preparation for again attacking the hero. (Spider-Man #610) - Wednesday. Having defeated Assassin-8, apparently at the cost of the cyborg's life, a weary Spider-Man stumbled from Gloucester Road Underground Station; it began raining, adding to the hero's depressed mood. Posing as a newspaper seller and with his face mostly hidden by a pulled up collar and pulled down cap, the Dark Man offered Spidey a free newspaper showing a headline about the hero saving the Thames Flood Barrier. Spider-Man was surprised at how fast the press had caught the story (not suspecting that, since the incident in question was only an hour or so old, that that newspaper was probably one of the Dark Man's illusions), but cheered slightly by the positive headline. 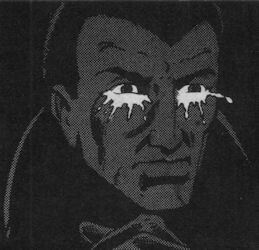 The Dark Man, feigning casual interest, asked if the hero would be staying long in London, and when Spider-Man said his trip was almost over, the Dark Man asked if he would come back soon and stay longer. As he swung off, Spider-Man replied that he had a feeling he might just do that (see main entry comments), and the Dark Man knowingly responded quietly that he had a similar feeling. His seed planted, the Dark Man expected there would be another conflict with Spider-Man once it the idea became fully formed. As Peter Parker flew home from Heathrow Airport, he wondered about his nightmare from a week earlier, noting that it had all come true, apart from the shadowy man with glowing eyes. Unaware he was still being telepathically eavesdropped on, Peter considered that he would probably return to London soon, if only to try and clear up the unanswered questions from the visit - who was the man with glowing eyes and why did he feel he was being toyed with, as if he was only being prepared for the real fight? The Dark Man grinned; he had tested Spider-Man's mettle, assaulted him magically and physically, and found Spider-Man worthy of the tasks to come. Comments: The identity of the telepath who recruited Assassin-8, and the reasons why said individual wanted Spider-Man dead, were not made clear. The descriptions we did get tell us his powers were magical, and the description saying he was not human but a creature of darkness suggest something demonic. When this profile was first published, I dubbed him "Bright Eyes" simply because his eyes glowed every time he used his powers, but writer Mike Collins identified him as "the Dark Man" in Marvel Fact Files #97's entry on this story. The story was created because Marvel UK's offices were worried that British readers might not take to the impending change to Spider-Man's black costume, and so decided to test the waters for homegrown stories, hence why the Dark Mans' plotline was left dangling. As it turned out, their fears were unfounded, and British readers were fine with the costume change, so Marvel U.K. never returned to this plot.